Been working on this since early September or so. It is deep. It is, for me, one of the richest, most thoughtful books I’ve read. Ever. Look at the top of the picture of the book. Yeah. Nobel Prize for Literature. I don’t even know what that takes. 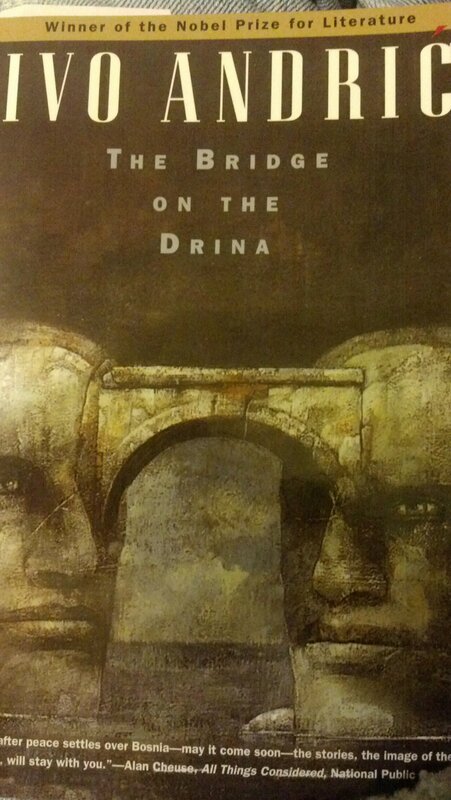 If you EVER want to read a single book that will give insight into the Balkans, read this. But, its not a popular page-turner. You have to stop and think along the way, sometimes deeply, other times you just have to stop and take a break. So if you take this on, give your self time. But be warned. There is extreme brutality. The author did not shy away from describing graphic horror. As a Yugoslavian (what does that even mean to readers today? ), he knew the need to describe the brutality that existed back then, in recent history and that continues today in more subtle ways. I once went to the monument park in Mohacs, Hungary where there are wood carvings depicting humans impaled after being defeated by a superior Ottoman army. I now have a better understanding of what took place there and, more importantly, I have a better understanding of why the anti-Turk atmosphere existed when I first began visiting Hungary 16 years ago. That attitude seems to have subsided since today there are Turkish eateries every two blocks in Budapest. I also learned how deep is the wound is between Serb and the converts to Islam. It is all very, very complicated. And I guess the main thing that I learned is how dark those Drina river valleys are and how deep is the need for the true Gospel of Jesus, the Gospel of Grace, the Gospel of forgiveness in this region. Tomorrow, I will introduce a book that is more contemporary, but the region is the same. This is one of my favorite books of all time. Another book I loved was Balkan Ghosts by Robert Kaplan. Have you read it? Yes, Kaplan was actually my introduction to studying the region’s history and culture. Another book he wrote might be interesting for you: _Eastward to Tartary_ which begins in Budapest and moves east through the Caucasus region. Yes, I read that one too. Not as captivating for me as Balkan Ghosts, but worth the read. I looked into some of his other books but never found anything else like these two.